Greetings Hometown News readers! My name is Rebecca Hill and I’m an innkeeper at the Inn at Playa del Rey–a boutique bed and breakfast on Culver Boulevard that overlooks the Ballona Wetlands. I’m excited to have this opportunity to share some of the Inn’s best kept, most loved recipes with you and it’s my hope that if you like them, you will share them with your friends and family! When we all move our clocks forward for Daylight Saving Time on Sunday, March 13 we’ll be losing an hour, so I want to show you how to make that time up with the Inn’s super fast, super simple and totally delicious homemade Cheese Soufflé recipe. It’s nice and easy! No previous cooking or baking skills required. I’ll walk you through this step-by-step and prep time is only 20 minutes! This recipe is very convenient because you prep it the night before. The next morning you simply pop the soufflé into the oven and let it bake, leaving you time to gather the little ones for soccer practice, get ready for your golf game or set the table for a big Easter brunch. Let us know how it goes–we’d be delighted if you’d photograph your soufflé and post it on the Hometown News’ Facebook page at facebook.com/thehtn. I’ll be back next month with the Inn’s amazing homemade chocolate chip cookie recipe. Happy baking! • Spray pan liberally with oil spray. • Sprinkle 1 cup of cheese evenly over the bottom of the baking dish. • Place the bread evenly over the cheese, covering as much of the bottom of the pan as possible. • In a separate bowl combine the eggs and milk until well-mixed. Pour egg mixture over the bread, making sure all the bread is saturated. • Sprinkle the remaining cheese on top, season with salt and pepper, cover and refrigerate overnight. • Bake in a preheated 350 degree oven for 35-45 minutes or until eggs are firm and soufflé is puffy. Serve immediately. Feel free to spruce up the recipe by adding any variety of fresh vegetables, like mushrooms, spinach, broccoli, sun-dried tomatoes, onion or artichokes. Adventurous with spices? This recipe is easily spiced up with a dash of garlic powder, oregano, thyme or rosemary. As innkeepers, we care for our guests in many ways. One of those ways is to nurture their bodies and souls through the celebration of good food. We believe food, compassion and inspired service are inextricably intertwined and are the key ingredients to making our Inn a sanctuary where guests can come to rest, rejuvenate, reconnect and revitalize their souls. It is my hope that you will use our recipes to express your love for friends and family in the same way. Taking time to prepare food and eat together is a way to make sure the bonds of family and friendship stay strong. Rebecca Hill is an innkeeper at the Inn at Playa del Rey and a published writer. Her stories have appeared in Redbook magazine and in over a dozen Chicken Soup for the Soul anthologies. 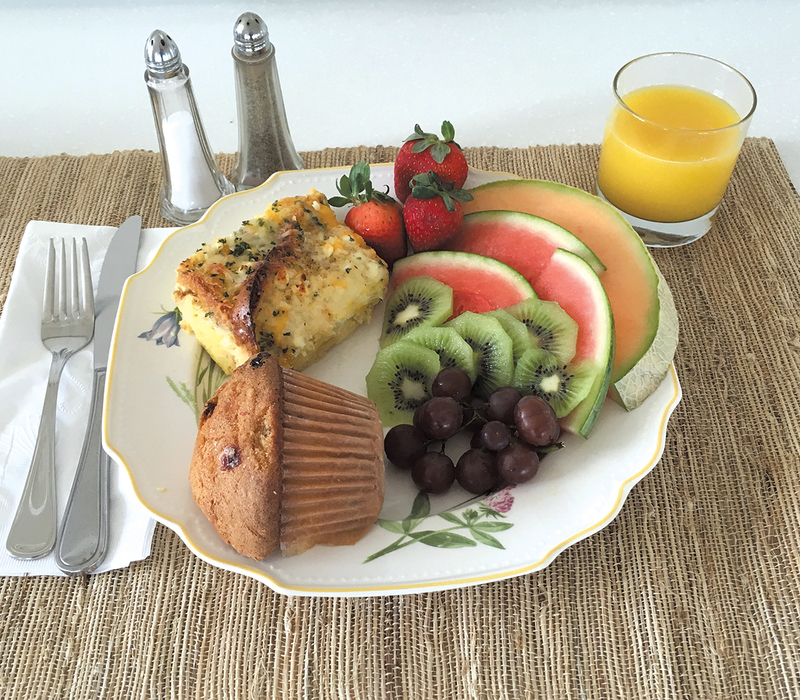 Pictured: Pair the soufflé with fruit and a muffin for the perfect brunch meal. Photo by Liz Hall.